We do kindly SUGGEST you to use it with the professional recording sound card or 48V phantom power(NOT INCLUDED) for achieving the best results of the microphone. The Stand is NOT Suitable for Blue Yeti USB Microphone. The desk and computer are not included. Widely used in public broadcasting studio recording online singing games Skype chat podcast network teaching video Conferencing speech, etc. The sturdy metal body is presented in a stylish black. The 16mm electret microphone capsule and steel basket guarantee durability and ruggedness, making it suitable for on-the- road use, as well as in the studio. 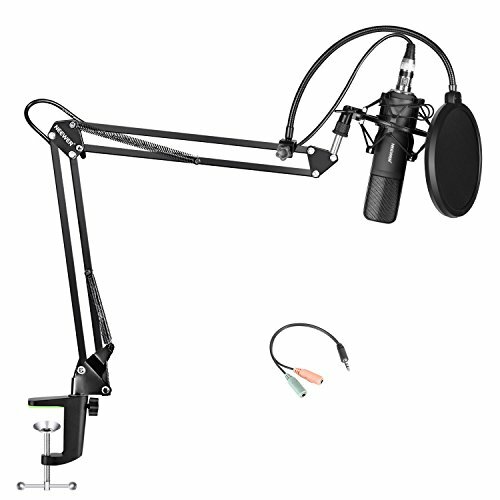 Can be firmly attached the microphone anywhere with the mounting clamp. 360 Degree flexible gooseneck holder, convenient for use. Goose neck for precise positioning.